And did my roll of the dice pay off? At $54 a pop... it certainly was no small thing to sneeze at. But it did pay off. 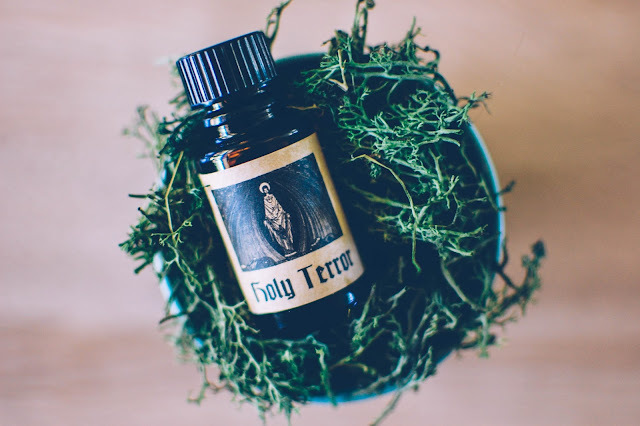 Holy Terror- Notes: Burning frankincense, sandalwood, deep myrrh, and dusty beeswax candles. Smoldering euphoria. Fragrant offering. Just opening this amber flask of fragrance releases a honeyed plume of burning resins and woods that take flight and rise like the fuliginous spirits of ravens passing into the next realm. 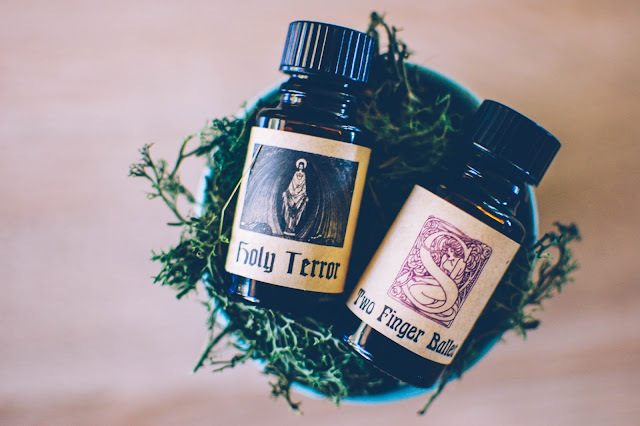 Dabbed fresh onto the wrists and crooks of the arms, sandalwood incense warm and thready weaves itself under my nose. Honeyed plumes of smoke cling to this corporeal being, absorbing prayers then lifting them skywards. Stygian smoke and resins are balanced by the antique burnished glow of the beeswax candles and powdery myrrh and honey. Mysterious, ancient, sweet smoke and incensed woods. This morphling shifts and undulates like a dancing flame. Entranced by this potion. A stellar blind buy. 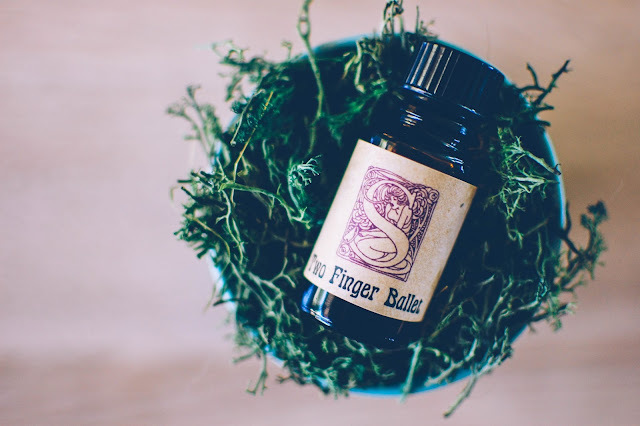 Two Finger Ballet- Notes: French vanilla creme, white amber, sugared vanilla beans, caramel, and the smallest dab of opium. This name. Ooooooh this name. And OH! That dance. What a delicious tribute, that is just as drippingly sweet. In the vessel an enticing aphrodisiac of dulcet caramel and frothy vanilla cream pour forth in a stream of warm sticky sweetness. Just underneath lurks the hint that something darker may be in store. Caressed into the skin, moist and damp, the scent makes my mouth water. Caramel cupcakes, dense and rich and gooey, crowned with mounds of whipped cream frosting and a sprinkle of toasted cinnamon. As this tantalizing scent settles, it grows darker with cozy tonka beans and deep golden honey. Almost narcotic. The sultry ambered honey and vanilla creme turns innocently sweet at the tail end of its time. Bite and kiss. The last kiss smells of marshmallow vanilla. Thrilled to have a big bottle of this vanilla laden dream. Free samples in Breakfast in Hollywood (reviewed previously here) and Swashbuckler. Swashbuckler- West Indies bay rum, scurvy-preventing limes, and a dark blend of spices. 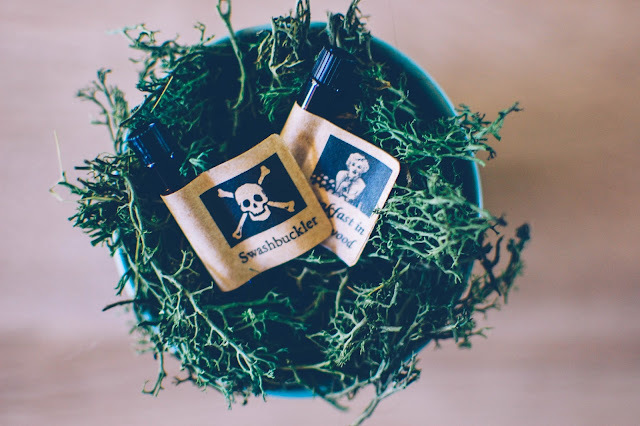 Damp in the crooks of my arms and resting on my wrists, this swashbuckling pirate is redolent of dried lime peels and the burning black licorice and clove cigarette perched between his salt encrusted beard and hard edged upper lip. I could feel the cinnamon and clove warming and tingling my tender skin in the crook and I enjoy it. That sensation only lasted minutes. As the spicy spartan pirate mellowed on the skin, the vintage Bay Rum he used for his morning ablutions drifted forth in a virile, yet familiar, mist of Jamaican rum, bay leaves and spice. A subtle current of grassy vetiver and old wooden curls of cinnamon bark whorl on the trade wind pushing into my senses. The last token of his presence before he evanesced into the briny brume was a solitary scent trail of Bay Rum. I really love Swashbuckler. I could totally see a full bottle being purchased with no regrets at all. And I did purchase two more bottle, regular 5ml size this time... but you will have to wait and see what I picked up. Julia did have a buy 4 get a bottle of This Is Not The Carnival for free. I wanted to buy 4 at the time but I ended up talking myself down from the ledge and just picked up two bottles I was eyeing hard. Do you have any new fragrance additions in your home? Tried Arcana yet? 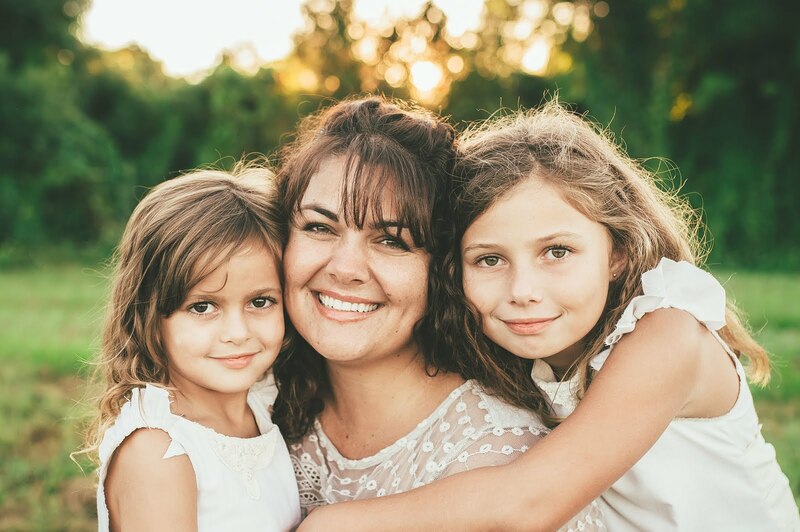 I'm so enjoying hearing about your journey with Arcana. Since my soaps arrived I have rekindled my feelings for Arcana. Even if faded slightly from their original glory they are treasures! Before I closed off the package I sent you I took a couple deep inhales of Queen Crossbones. I hope it will be as lovely to use, it looked like it would be luxurious with the black cocoa butter. Jean. You are the best!!! But why doesn't she take paypal?!?! Now I am paranoid they will sell out! Doh. Thank you for the natural reference list. Will look into Huntress if I can. I remember asking her about that! I think Paypal takes more in fees than the credit cards so she doesn't offer it. :-| You can take your time I think, they seem to have stayed hidden there for a long time. Oh ok... I get that. I went ahead and got the Arcanas I wanted and the Haunts. I have been wanting to try Haunt ever since that milk bath you gave me. And only $4 a pop? Yes, please. There were a few Poison Apple Apothecary scents I wanted to try too but held back. They must be pretty well aged! Didn't Poison Apple have a change of ownership a while back? These look like the old owner labels. Have you tried them?? Oooooo! Maybe Swashbuckler and Vampire's Garden (and heck, even Absinthe) will stay in stock for a little bit. I can send that Vampire's Garden to Ashley. Is shipping reasonable? This is where you got those soaps? I might have a Poison Apple decant somewhere but can't recall anything about it! I don't think I ordered from DLaP but asked them about shipping one time, they said if shipping seems high they can weigh and bill you for exactly the weight of whatever box they use if you order by emailing them. Ok! Then I will hold out for those until later. Thank you for the info! You are the best, Jean. I cannot wait to tear into Queen Crossbones. Makes me wish I had that scent in the perfume oil too. Both those soaps smell amazing. As you should be. I love it! I even wrote the review with a few double entendres. It totally refers to twirling the pearl. And who doesn't love THAT?! Hahahahaaa!!! My alley is closed due to a murder investigation at the moment. Ugh. These were totally up my alley. I figured they would be based on notes but sometimes it is still a gamble. You might like the Two Finger? She originally released this under a naughty themed collection a few years ago. Twirling the Pearl is one that I highly recommend for a lavender/marshmallow/honey blend. Then there was Fluffing the Bunny that was popular (apricot and mint). Paddling the Pink Canoe was another. Julie, have you tried her Apples Crave Terror and Pumpkins Crave Terror? Theyre incredible! Twirling the Pearl?! Paddling the Pink Canoe?! I am dying here. Dying. She recently brought back a ton of older releases and I think these were part of it. I will look into Twirling the Pearl for sure. I have not tried Apples or Pumpkins Crave Terror. But I want to so bad. Maybe she will bring them back. Right now she is bringing back a few Strawberries Crave scents. I have not sampled any of those. I did see Vanilla Craves Terror but wasn't sure if I should add yet another vanilla to my collection. I am on a bit of a vanilla tear. Hey! Kris! Did you like Haunt? There are $3.95 Haunt bottles on sale at that link Jean posted above. I went and picked some up. I had been wanting to try more Haunt but well, closed shop and all.